Pentru prima oara pe PRwave organizam un concurs cu premiu de la Editura ALL. 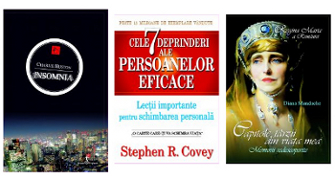 – Cele 7 deprinderi ale persoanelor eficace de Stephen R. Covey. Pentru a putea participa la concurs nu trebuie sa faceti nimic altceva decat sa ne raspundeti la o intrebare in topicul de concurs. this in future. A lot of other people will be benefited out of your writing. item received quickly and in excellent condition. Great price too. Thanks!! PRwave | Violeta-Loredana Pascal. Afaceri, imagine, comunicare, relatii publice si personal < Loved it! In either case, wrap a tight fitting bungee cord towards the bottom of the grill to prevent the wind from blowing your cover into your neighbor’s yard. They range in the twenty to forty dollar range for a cover. Wonderful goods from you, man. I have remember your stuff previous to and you are simply too great. during which you assert it. You make it entertaining and you still take care of to stay it wise.